Looking for an organic solution for keeping bugs away this summer? If you’re like me you’re probably not fond of spraying an unknown array of chemicals all over your kids (and yourself). Sometimes it can be hard to even distinguish what’s potentially harmful just by reading a label! Last summer I discovered a new essential oil blend that I LOVE. Rocky Mountain Oils carries a blend called “Bug Away”, found here. You could, of course, purchase all the eight oils separately that are found in this blend, but unless you already have them all on hand (and want to spend time figuring out the ratios), this blend will be more cost effective and much easier! Based on the recommended ratios found on the product page (Look at the “usage” tab), for a 2-oz bottle like the one I used in the picture, you would just divide the recipe in half. All you have to do is fill the bottle with distilled water – leaving a little room for air at the top, then add approximately 37 drops of Bug Away, and voila! Natural bug spray. These glass spray bottles were very inexpensive at my local natural foods store. You can also find a set on Amazon like the ones pictured below. I found the 2-oz size to be great for my purse or bag. It’s a fine mist spray so it will last a long time even in a small bottle like these. In my opinion, this blend has a pleasing, light scent and I didn’t find the citronella to be too strong or overpowering. 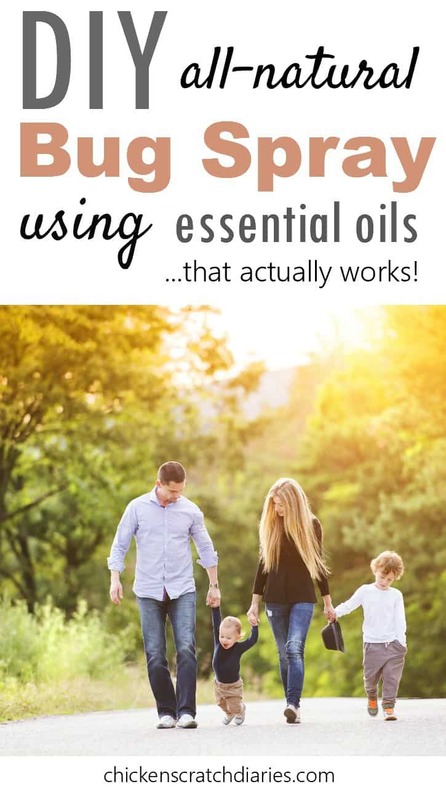 I don’t consider myself an essential oil expert, but as I’ve been on a quest to use less chemicals in my home in recent years, I’ve spent some time researching different essential oils and which brands are deemed pure as well as beneficial. I say all of this to say: I have been using oils from Rocky Mountain Oils for two years now and I’m really impressed with everything I’ve purchased. RMO has an outstanding reputation in the oily world, which makes me more than happy to recommend them to my readers! These oils are tested by an independent lab to assure quality, purity, and effectiveness. You can even input the batch number found on your bottle into their website and check out the lab report that verifies the purity of your bottle! As you can tell, I was totally comfortable using the Bug Away blend on my kids and personally consider it much safer than any bug repellent you’ll find at the drugstore, especially those containing DEET. If you haven’t tried Rocky Mountain Oils already, you should check them out! I’m in the Midwest and I honestly have no idea what kind of mosquitoes we have! But those sound scary 😉 Let us know how it works if you decide to try it!